Ed Herbst: DisGraceful. The gospel according to the Browse Moles. These are the worst of times and the worst of times, times of trauma and travail where the police are spying on the police minister and where one does not know what to believe as the anchor quotes on this article reveal. It is at such times that I seek the comforting intel of my Loot-freely House Browse Moles. I do so hesitantly and with circumspection because I realise that if ever their whistleblowing activities were revealed they would, like their fossorial counterparts, end up as cadavers floating face-down under a lotus leaf in some leafy suburb swimming pool, the victims of the justifiably feared ANC hit squads. But, like the rest of the country, I was dying to hear the story behind the story of the Harare Harridan’s recent rampage. The Browse Moles are normally full of bonhomie, always happy to dish out litres of Johnny Walker Black while they dish the dirt on the rich and infamous, always whimsical and of constantly satirical mien. This time, however, they were sombre. They were clearly feeling the devastating after- effects of yet another Fake News article by Independent Media. It led them to believe, however momentarily, that they and the legendary interns had had hearth and home sold from under them – that they would soon find themselves on the street like the close to a hundred former Iqbal Survé employees who were shown the door just before Christmas in a spirit of festive season ubuntu last year. The essence of what they told me is that the Union Building squad, in full damage control mode, hastily and abjectly apologised to their counterparts in the local Zanu PF consulate. They bowed, they scraped, they bent the knee, doffed their caps and obsequiously tugged at their forelocks. They bitterly rued the fact that a South African woman had had the temerity to interrupt the First Shopper’s daily bolas practise and that she had also rudely curtailed Madame Mugabe’s daily workout, rehearsing the use of blood diamond rings as knuckle dusters, to fend off future intrusions by the paparazzi in places like Hong Kong. Furthermore, as ANC MP Loyiso Mpumlwana subsequently pointed out, there were ancient precedents for Grace’s gracious response to the interference she so stoically experienced. To prove their pro-Zanu-PF bona fides, the ANC officials pointed out in a grovelling demarche letter that their movement was doing its best to emulate, in true National Democratic Revolution style, the way in which the Honourable Robert Mugabe MP has trashed Zimbabwe. Trashed the international human rights goodwill accrued during the Nelson Mandela era. Trashed the state broadcaster which had millions in the bank when the ANC was handed control in 1994 but now faces its second billion rand plus bailout. Trashed the ability of our food providers to protect themselves, thus exceeding the achievements in this regard of the revered Zanu-PF leader. To understand the Mugabes, my Browse Moles told me, you have to realise the extent of their unrealised ambitions and the deleterious psychological impact that this has had on them and their sons. Firmly committed to the dictum of ‘One Snouter, one Dacha’ as decreed in the Domesday Book of Snouting, they yearn to emulate the lifestyle of one of the richest champagne and caviar communists in the world, the late Fidel Castro but, unlike him, they don’t have an island to annex. Furthermore, the Mugabe’s sons have to slum it in a Johannesburg hotel for R70 000 a month, a humiliating relegation from the luxury of their previous R500 000 a month Dubai pad. All this while Castro’s offspring gambol and frolic in the fleshiest of Mediterranean fleshpots thanks to their father’s plunder. What role did Maite Nkoana-Mashabane, our International Relations and Co-operation Minister, play in the latest headline-grabbing drama by Zanu-PF’s answer to Imelda Marcos, I asked the Browse Moles? 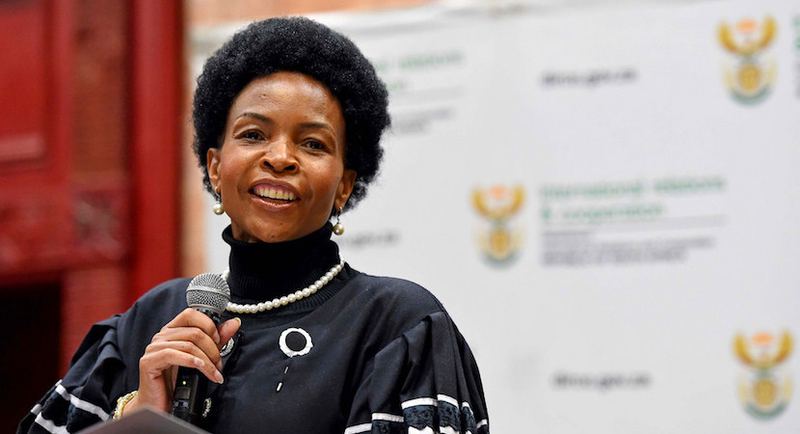 Minister of International Relations and Cooperation Maite Nkoana-Mashabane. 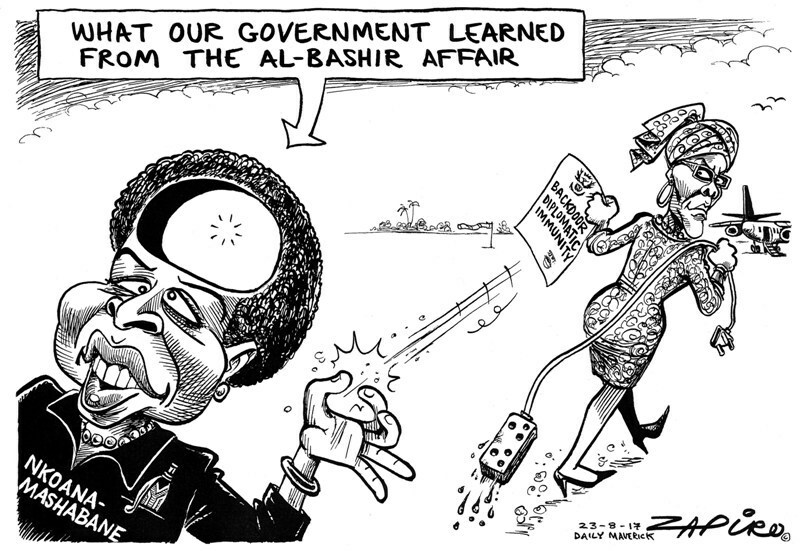 She carried off the obligatory snot en trane routine with aplomb and was clearly grateful for the valuable experience gleaned by the ANC in arranging the similarly-hasty departure of their great friend and revered revolutionary comrade, Omar al-Bashir. This time, however, things were a lot easier as it had not been necessary to lie to a full bench of the Supreme Court of Appeal. The Browse Moles also assured me that the strange acoustics at her media conferences were no reason for me to change my hearing aids but were the result of stray air conditioner breezes wafting through the hole in her head – an affliction she shared with my ex-SABC colleague and current Al Jazeera reporter, Jane Dutton. But I wanted more information. 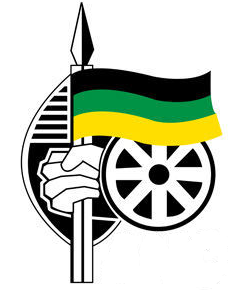 It is common cause that the ANC holds Hitachi in high esteem. So would you if one of your Cointreau Comrades had organised a 5000% return on a minimal investment in a company whose boiler-welding was so shite that it delayed the Medupi and Kusile projects for months thus facilitating the rollout of the ANC’s rolling blackout program. In September 2011, Maite Nkoana-Mashabane angrily refused to put her handbag through the X-ray scanner at Oslo airport and flounced off to hire a private business jet for a quarter of a million rand – your money and mine. It wasn’t the routine wasteful expenditure, a pervasive norm of ANC governance, that caused bewilderment – presidential hopeful Lindiwe Sisulu routinely splurges much more of your money and mine when it comes to Gravy Plane travel. No, what everyone wanted to know was – what was in the handbag? My information is that our imperious International Relations and Co-operation Minister was contractually-bound to Hitachi and thus took the honest and honourable step that she did. This is because, or so I was told by other sources, her handbag contained a top secret Hitachi Magic Wand test model which, as everyone knows – ask Wiki, they’ll tell you – has earned the universal acclaim of physiotherapists around the world. Top secret because it was, allegedly, a prototype equipped with an exquisitely engineered, miniaturised version of Hitachi’s iconic and intercooled RHC7 turbocharger which reaches 280 000 rpm. Not so, my Browse Moles informed me. They added that such misinformation is peddled by treasonous askaris who, in propagating such dastardly falsehoods, lie like a cheap watch and a post-Sekunjalo-takeover Cape Times front page lead. A pox on them and a plague on their cynical houses. Such vile innuendo, they assured me, is the sick-mind product of the evil, revanchist, running dog counter-revolutionaries who are the enemy of the proletariat, supporters of the fascist cause, occupiers of the Dark Internet, are virulently opposed to ‘Transformation’ and BBBEE, are proponents of White monopoly capital, denouncers of our glorious National Democratic Revolution as well as being foreign-funded, double-agents promoting Regime Change. They gleaned this, apparently, from that alleged rhino horn authority, the immaculately manicured, fierce opponent of gutter journalism and advocate of social media regulation, David (Signal Jammer) Mahlobo. So what did the handbag contain? They were sworn to secrecy, my Browse Moles swore. So what did I glean from all of this Browse Mole intel, what conclusions did I draw? My overriding conclusion is that the deployed cadres at the Government Communication and Information System (GCIS) are bloody slack. What I want to know is, did they inform Snopes that the Hitachi Magic Wand urban legend is an urban myth and, if not, why not? They are responsible for this typical ANC SNAFU/FUBAR situation – not merely sleeping in the sentry box but AWOL. But, satire aside, why does the African National Congress believe that is morally and ethically acceptable for one of its top representatives on the international stage to blow a quarter of a million rand by so publicly refusing to do what equivalent parliamentarians in Norway routinely do without a second thought – put their hand luggage through the X-ray baggage scanner at the Oslo airport? In the meantime my advice is to stay well away from the R43 million cash- purchase Sandhurst house that the Harare Harridan has recently acquired as part of her burgeoning property portfolio. 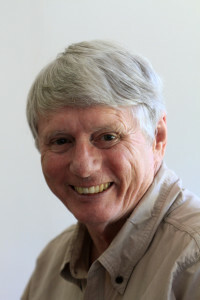 Benefit, I implore you, from the experience of British news photographer Richard Jones who was sorted out – Big Time – in January 2009 after enquiring with solicitude whether Mrs Mugabe was enjoying her visit to Hong Kong. “She was completely deranged, absolutely raging with anger,” Jones said. Believe me, if you don’t heed my advice, not even Gerrie Nel will be able to prevent you from experiencing your own and very painful rolling blackout.